Last weekend I attended the first New York City Wine and Food Festival. After eating my way through the grand tasting, sampling braised short ribs and caviar-topped deviled eggs, I focused my attention on something far more wholesome and important: how to feed our kids. This topic has recently taken on a new significance for me because I'm expecting my first child next spring. As a food-loving dietitian, my hopes are for a child with an adventurous palate and gusto for good, healthy food. But I could just as easily end up with a child who eats mac 'n' cheese at every meal. So I was keen to hear top food and nutrition experts speak at Beyond Chicken Nuggets: How to Raise a Healthy Eater. On the panel: Alice Waters, queen of the organic food movement and founder of Chez Panisse in Berkeley, Calif.; Rachael Ray, head of her own food media empire; Jessica Seinfeld, wife of Jerry and author of the much-criticized and best-selling cookbook Deceptively Delicious; Leann Birch, a Penn State professor of human development and the author of many key studies on eating behaviors in young kids; and Dr. Harvey Karp, author of The Happiest Baby on the Block and a godsend to many new parents. The discussion was moderated by Tara Parker-Pope, the Well columnist for The New York Times. Here are some key things that parents should stop doing. 1. Don't bribe your kids to eat their veggies. Whether it's TV time or dessert, a bribe may work for the short-term, but Dr. Birch's studies show that when kids are "paid off" to eat certain foods, they will ultimately develop a dislike for those foods. So what are you supposed to do? 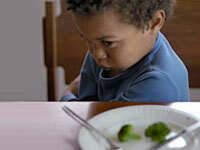 Offer the veggies, fruit, brown rice, etc., but don't force your kids to eat them. And set a good example (little kids actually will emulate their parents) by eating the healthy stuff yourself. 2. Don't put cookies on a pedestal. When treats like cookies and snack cakes are kept in tantalizing jars, or up on shelves, those goodies become much more appealing to kids. That's not to say that you should leave your 3-year-old with a bag of Oreos, but just don't turn them into the holy grail. And if you don't want to have temptations like that in your house, buy treats you don't have to limit, like fresh fruit and fig cookies. 3. Don't limit your child's diet to "kid food." Offering your kids a steady diet of pizza, chicken nuggets, butter-covered noodles, and fish sticks will ultimately lead to a child who only eats those tan foods. At family mealtime, Alice Waters discourages feeding kids separate foods from adults. While finding time to dine together can be a challenge, especially as kids get older, several studies point to its benefits (higher grades, less drug use, etc.). Waters suggests finding time during the week to dine together, even if it's at breakfast. 4. Don't give up! So you've offered your son broccoli five times and each time he refuses to try it. Don't worry—you may need to offer up that broccoli or those carrots between 15-18 times before your kid will try it! Sounds kind of crazy, but it's true. Again, don't force them to eat it, but encourage them to try it, letting them know they have the option of spitting it out. In her household, Jessica Seinfeld has a "lick it" rule. The kids have to at least lick a food before deciding they don't like it. Either way, keep offering up those peas! Here's a nugget from each of the experts that you can try at home with your own kids. Alice Waters: Don't assume that kids won't eat healthy or "different" foods. Set the table—even if it's only one day a week—and enjoy a meal together. Rachael Ray: Make it fun! Create a "Good Food Fund" with loose change you find in the couch and elsewhere, and use that money to add to your food budget to buy special things. Jessica Seinfeld: Go mini. Kids don't need huge treats, so try making tiny muffins, cupcakes, and other bite-size treats. And, of course, she suggests sneaking squash puree into pancakes. Leann Birch: Start offering a variety of foods early on, when kids are most receptive (around 15 months). And be a good role model by eating an array of healthy foods yourself. Harvey Karp: Decrease juice and soda, decrease the amount of TV your kids watch, and increase family exercise! Try to make small changes daily, but don't put too much pressure on yourself to do everything right. There you have it. These ideas may not be enough to turn around an incredibly fussy eater, but it won't hurt to try. Oh, and if you're pregnant like me, the best thing to do is eat a wide variety of foods while you're expecting. Turns out a baby is already getting used to what you're eating by way of the amniotic fluid. So it never really is too early to start.